Registration errors between the physical world and computer-generated objects are a central problem in AR systems. In our previous work we demonstrated how to dynamically estimate registration errors based on estimates of spatial errors in the system. Using these errors estimates, we demonstrated a number of ways of ameliorating the effects of registration error. One central part of our work was the creation, and use, of error regions around objects; unfortunately, the analytic methods used only created accurate regions for simple convex objects. 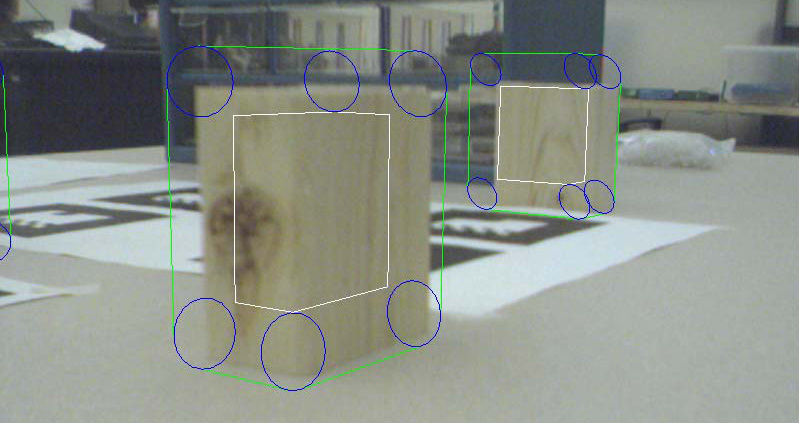 We present a simple algorithm for generating the uncertainty regions for complex objects, including non-convex objects and objects with interior holes. We demonstrate how our approach can be used to create a set of more accurate error-based highlights, and also used as a general highlighting mechanism. This work is supported by ONR Contract N000140010361. The code is pretty old at this point; what’s your use case? If you are just looking for an AR framework, there are many newer ones. Or are you specifically interested in some of OSGAR’s features? OSGAR is really wonderful tools .